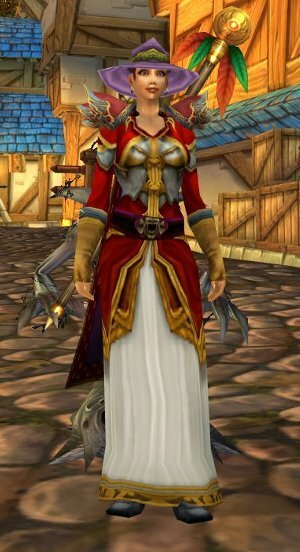 Here I am again with another segment of “What Not To Wear For Warlocks.” Last time I had fun with some on the Horde side, but this time we take it right to the Alliance capitol city of Stormwind, sweet Stormwind. I’m guessing that maybe, it’s all the pretty colors of this Alliance town that has these warlocks feeling like they should match their surroundings? I don’t know what the answer to that question is, but please take a look at the following so it can help give you valuable lessons in what not to wear for your ‘lock! The only thing looking good in this pic is her succubus and maybe the green bushes in the background. Names will be left out to protect the innocent, but PLEASE, PLEASE, PLEASE do not represent our class this way. Without getting too rough on this poor little gnome, I’ll try to point out the good qualities to stay positive. First, her Succubus looks good, and I’m glad she chose not to have the “pig-tail” option for hair selection as well. Okay, I’m done with the compliments. Warlocks do not have pink hair! How can people take your shrewd threats seriously if they are looking at that crop of cotton candy on your head? It won’t happen! While her engineering goggles were a nice attempt, they are sadly lost in the land I like to call “Ugh!”. This little mage ‘lock broke our Female Warlock rule #1. If you’re not a Belf or Human, then you shouldn’t have any skin showing. No exceptions! My advice to this young lass is to first find a helmet. Any helmet. The largest helmet she can find would be a fine recommend since it won’t matter matching that horrid outfit. Young lady, once you find your new headgear, please make sure to turn on the “Show Helm” option. Your next investment should be to purchase both a gown and a long sleeve shirt to cover up the arms and midriff. When your done, head straight to the barber shop and change your hairstyle just in case you forget and happen to remove the helm. Hey accidents happen right? That means, no stopping to look for balloons or buying any white kittens from Timmy while your on your way. Stick with the basics girl and you’ll be fine! For more inspiration you might head over to The Slaughtered Lamb tavern and look around. If you can’t live up to our warlock code of standards then luckily, the mage tower in Stormwind isn’t too far from where your standing. I hear they like outfits like that. okay I’m done. Okay, here is our next victim..er I mean Warlock. OMG is this a Stormwind elementary teacher or does she work at the SW orphanage passing out balloons? It’s difficult to see from this snapshot, but this nice young warlock is touting a Withers vanity pet behind her. Hrm, let me take a deep breath and I’ll hit the positives first like I will always try to do. Ah-hem, okay now I’m good. First, Withers is a great pet for warlocks, who doesn’t love a ghoulish little tree? So her vanity pet choice gives me hope. However, it appears she was trying to coordinate colors, albeit very bright mage-y and colorful ones. From there her outfit completely falls apart. Not only would I mistake this ‘lock for a mage, but she looks like my second grade school teacher. Oh noes! It’s the evil “School-Marm!”, “Look-out!”, “Flee, hide your children!”. If you were going for the mage look might I compliment you on the light purple hat and staff with the colorful feathers? What is very sad is that I didn’t quite capture the image of her Felguard off to the side of this picture. Now stop laughing. I know your laughing because like me, you can picture this pitiful-magey-school-marm-looking warlock with a Felguard standing next to her as her summoned demon of choice. Really it’s true. 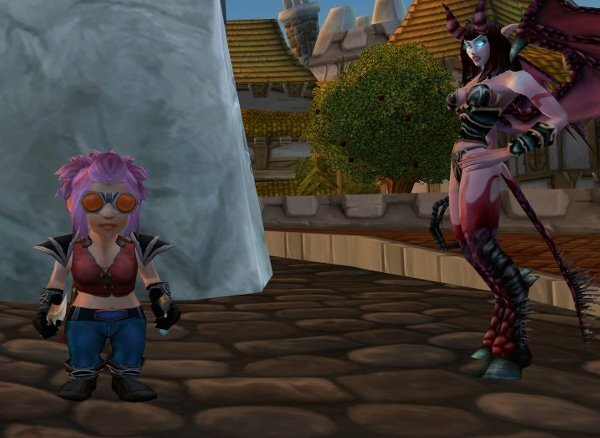 Here is my advice for finding a better style with a total transmog transformation. First, good effort on keeping colors matching but think dark while your at the AH next time. No, let me rephrase that, think very dark. Think black, black and more black. If you forget what I mean then just turn around and look at your Withers if you need inspiration. Next, burn that ugly, mage-y, OMG-I-can’t-look-at-it blueish hat right now and don’t think twice about it. No thinking twice about it! Don’t farm with it, don’t quest with it, don’t wear it for fun. Burn it! The good news is if you want to show some skin, being a human (or a belf) you would be safe to do so. I know the staff you chose is big and might seem intimidating to a singing sunflower vanity pet, it just won’t work when fighting against your enemies. Always remember that when chosing a weapon, you need to think of things that are sharp, jagged, tearing, or painful in their presentations. That staff makes it look like she’s going to herd sheep in front of the SW gates! Would you really be caught flagged defending Goldshire in that set? Girl please! Next time I want some improvement please. Your making this harder than it should be…your a warlock! Now, I don’t want to just pick on our female bretheren. Hrm, can I say that? You know what I mean. So here is a very nice male warlock who we can make fun of or Tease help give some time Tmog advice that will enable him the Master of Disaster he truly wants to be. Good effort but why do I feel like I’ve seen this guy at the Dark Moon Faire collecting ticket stubs at the toy-tank booth? Okay, first with discussing the good qualities of this outfit. This warlock appears to be wearing all drops that yes, could be used by warlocks. Luckily, since we have Tmog we don’t have to get cornered into thinking that a look like this would be smexy. It’s not. This style of clothing is for a mage or a discipline priest look. A few of the Spriests I know, love shifting to their Shadowform because it hides so much. Maybe in Shadowform, a shadow priest might be able to get away with wearing an outfit like this while being cloaked within dark shadows…but for you? Nada! He did a good job matching the shoulders and belt and that’s about it when it comes to attempting any kind of coordination with his individual item pieces. If this guy was on my team for PvP, I would either have to drop group or target him myself. My best advice to him would be to go back to the basics. Stop for a few hours and think about why he wanted to be a warlock? Wasn’t your goal for dabbling in the Fel-Arts to strike fear into the hearts of others? Do you really think that is what your accomplishing with these stormwind orphan hand-me downs? Here are some power words for you to ponder. Think: Black, Bones, Spikes, Pain and Fear! Don’t forget to think of fear! You want enemies to flee because of the fear you invoke when they see you, and not by instilling fear because they don’t want to look like you. See the difference? Next time, I hope he has earned enough JP badges to grab a good PvP set or anything from the Dalaran JP vendors to Tmog. What is that like 7 or maybe 8 heroics runs? Upon inspection, I also noticed this player was fully gemmed and enchanted. Being gemmed and enchanted is extremely important when it comes to your Rdps output, but really you couldn’t spend another 60-80 g for a couple of good transmog pieces? Please! I don’t want to hear it because that outfit screams fail loud enough! Okay, enough with the bad Tmog stuff. 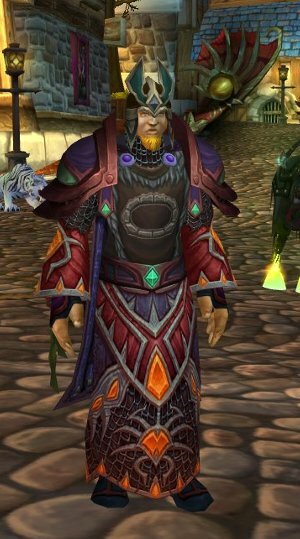 Let’s see some warlock fashion ideas that work! This young lady below shall remain nameless because of the soon to be adoring fans who see this picture. She was quite helpful and explained she wears a different outfit everyday and loves to mix and match her sets. I wish I could afford that! But if all of her outfits look along the lines of this red, black and orange yumminess then I’m sure she puts the “hawt” in hawtness on her server. People were actually trying to bribe her to /dance on the AH platform, and like a true warlock she didn’t give in. If you pay particular notice, you never once glance at her Succubus! Nice job girl! A Demonic Angel! <;3 this! Wow, which one is the Succubus? Wow, I can’t say enough about how simple and dominating her outfit is…it just screams, “Rawr!” With her nice mix of colors and the added fiery special effects on some of her items, that puts her outfit up there in the A-list with a great balance of texture, color, style and flair. She is a human warlock so yes, she can afford to show as much skin as she wants. I thought it was funny when she told me she still worried about not finding a good set of matching boots. Ha! Silly hawt warlock, no one will notice your boots! Trust me on that one! Good job! Well this next warlock was so brooding he even ignored my command to stand so that I could take a better snapshot of his Tmog set. 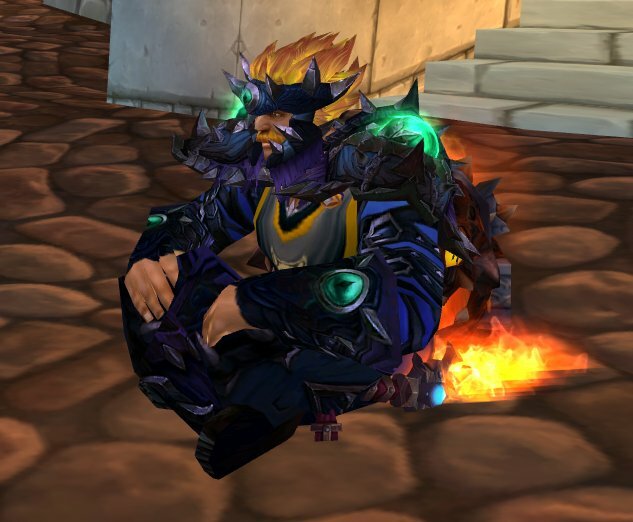 However, with the keen flair and style he was wearing, even sitting he still, he kept the impending doom of a good warlock presence! Nice job. All ilvl 403 gear I might add. Matching ilvl 403 gear. Very nice, dark, forboding and it works. This last player showed true worgen form and did a great job of representing warlocks. At first, I wasn’t sure if I liked the “Show Helm” option for this helmet, but it actually looked good from my view. 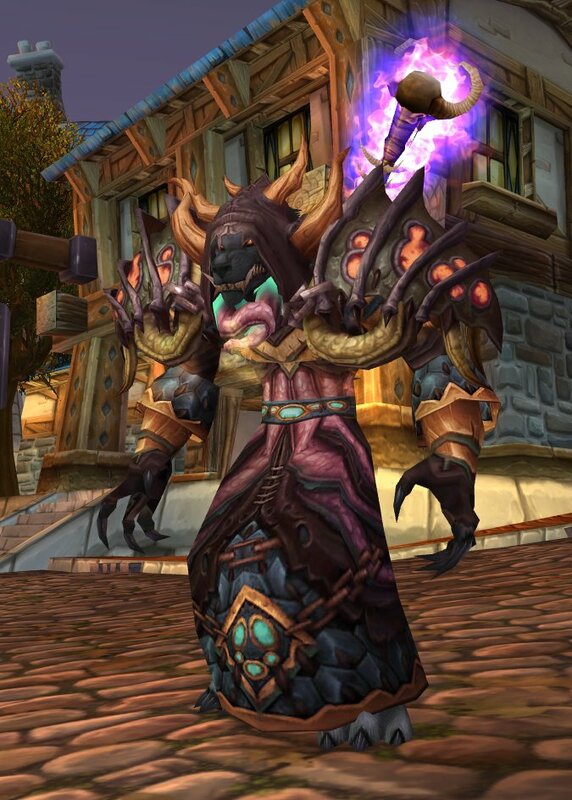 Remember, only in rare circumstance should a worgen warlock ever wear a helmet. Nice job on the look and I hope to see more! Nice job of covering up all the fur. Remember as worgens you should cover as much fur as possible and no running on all fours! Just don’t! It’s the little things that really pull good warlock Tmog set together. Keep it simple, keep it basic. Focus others attention on one, or two really stand out items and then build your set from there. Good luck and have fun Tmog! Make us proud!